Once considered waste, biomass is now being used in the production of cellulosic ethanol and as a new revenue source for farmers. This spring, Rick Elbert looked out over his 1,400 acres of corn and saw row upon row of emerging green. Step back a few months, to the leaded skies of winter, when his fields were mostly a monochrome of tans and browns. But in those fallow fields, Elbert says he could see a different kind of green, too. It’s the money the Emmetsburg, Iowa farmer made by bringing baled corn stover to Project LIBERTY, POET’s ground-breaking cellulosic ethanol plant. With a ticket from POET and government incentives, Elbert pocketed about $68,000 for something he used to let his cattle and hogs pick through, then tilled under before planting anew. This past winter, POET began taking delivery of its first commercial biomass harvest of corn cobs and light stover. Officials are now test-storing the materials at a 22-acre stackyard outside its existing corn ethanol plant near Emmetsburg. Eighty-five farmers have delivered nearly all the 56,000 tons POET needs to further test its theories about turning light stover and corn cobs into cellulosic ethanol. The company’s goal, according to POET Chief Executive Officer Jeff Broin, is to be responsible for 3.5 billion gallons of cellulosic ethanol by 2022. And that all starts with biomass – what some farmers would call a waste product – of cob, leaves, husks and some corn stalk. When operational, Project LIBERTY is expected to produce 25 million gallons of cellulosic ethanol a year. POET’s pilot-scale plant in Scotland, S.D. already is producing cellulosic ethanol at a rate of about 20,000 gallons per year. 1. One billion gallons of production capacity will come from adding the technology to POET’s existing network of 26 corn-based ethanol plants. 2. Licensing that technology to other corn-based ethanol producers will lead to another 1.4 billion gallons of production capacity. 3. Another 1.1 billion gallons of production capacity will come from a wide variety of other feedstocks from across the U.S. These gallons will be produced by POET or through joint ventures and opportunities where POET Biomass provides logistics support to other producers. “We’re committed to working with researchers and farmers to make sure this is done correctly, and it looks like that is the case right now,” Broin said. What POET hopes to understand with these first bold cellulosic ethanol steps – and that’s being backed up by two ongoing research projects – is the best way to harvest, ship and store biomass to get the most bang for the investment, while caring for arguably the best growing soil in all the world. Research is at the heart of POET’s cellulosic revolution. Dr. Douglas L. Karlen with Unites States Department of Agriculture (USDA)-Agricultural Research Service and Dr. Stuart Birrell with Iowa State University (ISU) recently released their third-year results on how soil health is affected by the removal of crop residue. While out West, Kevin Kenney, Lead Research Engineer with the U.S. Department of Energy’s (DOE) Idaho National Laboratory, is busy sorting out data from a second year of study on how best to store corn stover so the carbohydrates don’t completely break down before being turned into biofuel. The newest USDA/ISU data confirms previous claims that removing about 1 bone-dry ton per acre (which is about 25 percent of the area’s above-ground crop residue) will not cause significant nutrient loss. In fact, corn yields continued to show no yield loss – or moderate increases – in fields with this rate of biomass removal, according to the research summary prepared by Drs. Karlen and Birrell. When operational, Project LIBERTY will use some 300,000 tons of biomass annually. The DOE’s Kenney says his preliminary research indicates corn stover collected from farmers’ fields can be successfully stored prior to the ethanol conversion process. But he cautioned that it’s going to take time – and more years of study – to accurately pinpoint how much storage loss is acceptable before the biomass is converted to cellulosic ethanol. The two years of the DOE study have been polar opposites, as far as environmental conditions, Kenney says. In 2009, Iowa saw one of the wettest years on record. In 2010, it was much drier. Those results, Kenney says, will be delivered to the DOE and POET by September. And that’s why POET’s 22-acre biomass stackyard near Emmetsburg is such an important piece of the puzzle, says Adam Wirt, Regional Biomass Coordinator for POET. The yard was completed in October and took its first biomass delivery in January. What complicated things was the devil in the details, Wirt says, as farmers who signed onto participating in the commercial collection had to sit out some bad weather – and then waited as the guidelines for the U.S. Department of Agriculture’s Biomass Crop Assistance Program (BCAP) were finalized. 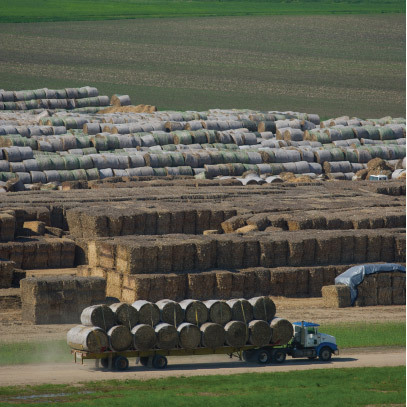 Meant to offset startup costs for developing the feedstock market for cellulosic ethanol and other alternative energy endeavors, government incentives – including BCAP and a DOE incentive – provided farmers an additional means of revenue for their early entry in biomass collection. POET officials stressed that what’s happening around Emmetsburg is a work in progress, but that POET is committed to the farmer – and to the nation’s driving public – to do what is right for the land and the future of clean, green biofuels. For Elbert, what this all means is not only a new revenue source for his farming operation – but a farming future for his son, Kyle. The 20-year-old modified the family’s baler and did custom baling and hauling for several of the farmers who provided biomass to Project LIBERTY.